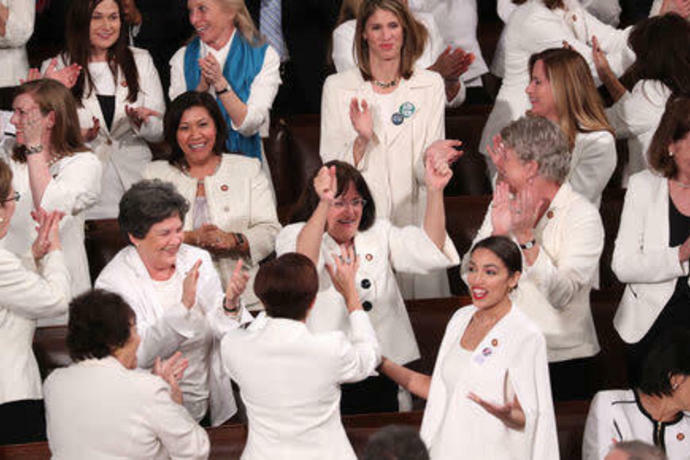 WASHINGTON (Reuters) - He didn't count on the women in white. 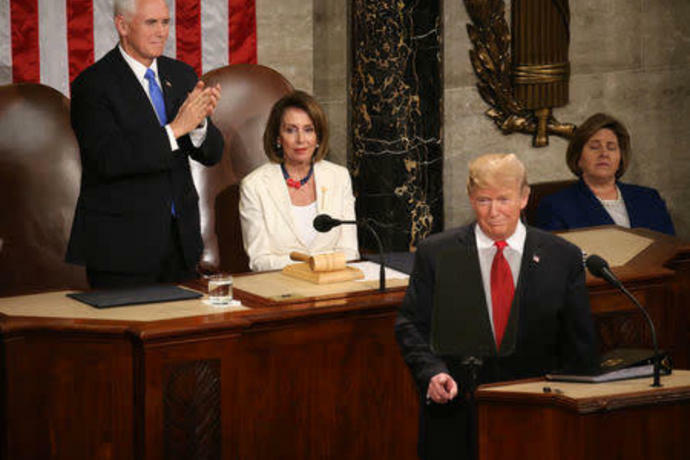 President Donald Trump's State of the Union speech on Tuesday was billed as his attempt to unify the country. 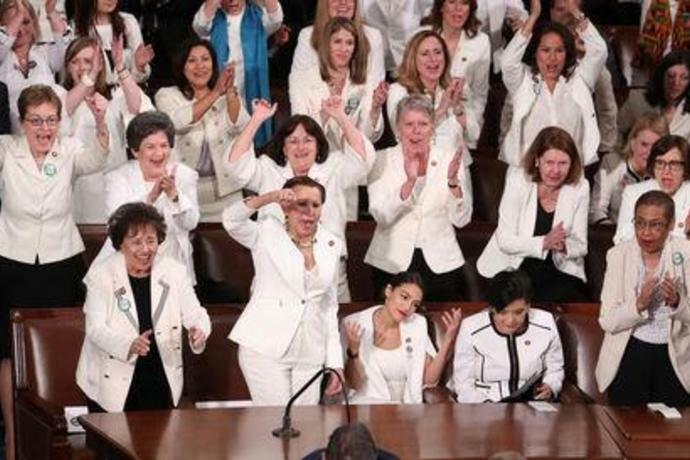 But Democratic women lawmakers from the House of Representatives, many of them dressed elegantly in white to celebrate 100 years of women having the right to vote, projected a picture of calm displeasure during Trump's speech that made clear his version of unity was not one they could accept. "You weren't supposed to do that," Trump said with a smile, pointing at them and drawing laughter. They cheered some more and chanted: "USA, USA!" Republicans joined in. 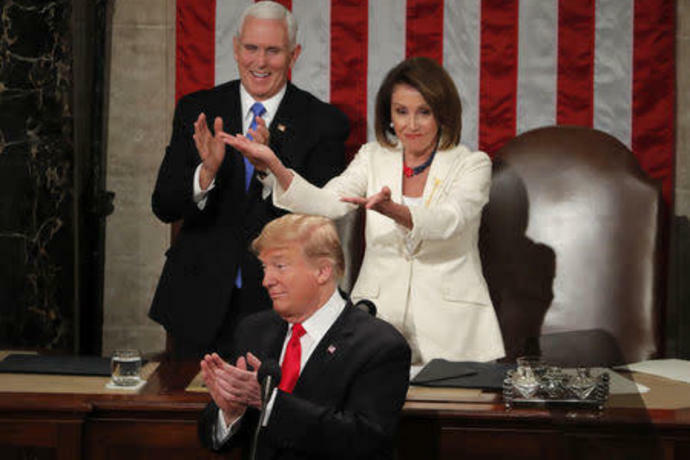 It was a rare moment during the long speech, which otherwise drew mixed reactions from the audience, divided with Republicans on one side of the chamber and Democrats on the other, in a reflection of the deep partisan chasm that has characterized the country before and after Trump's 2016 election victory. When Trump said the United States would be at war with North Korea had he not won the presidency, Democrats groaned. When he declared the state of the union "strong," they disagreed and most stayed in their seats. When he warned against "ridiculous partisan investigations," the sound of hissing could be heard. The image-conscious president's signature red tie hung slightly to the left in his jacket as he walked in, and stayed that way while he spoke. In the chamber's balcony, first lady Melania Trump, dressed in black, sat with specially invited guests. Pelosi's guests included two active-duty transgender members of the U.S. Army, Captain Jennifer Peace and Major Ian Brown, in a critique of Trump's efforts to ban transgender men and women from serving in the military. Pelosi essentially rescinded Trump's invitation to deliver his address in the House chamber. The White House considered choosing another location for the president's speech, perhaps at a venue near the U.S.-Mexico border to emphasize his call for a wall to keep out illegal immigrants. But Trump decided to delay, wanting the pageantry and spotlight that only come with the annual address to Congress inside the Capitol's walls.